Talk is cheap. And from the looks of it, so is billboard space around Phoenix. 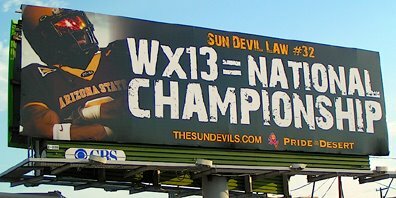 Arizona State, somewhere in the neighborhood of 80-1 to win the national championship, is making rather bold statements in a promotional campaign. "Sun Devil Law" is the theme, and from the looks of it, there appear to be laws on the books that we never knew existed. ... We've only scratched the surface, but thanks to the excellent work of Hog, Hills, SEC, you can get more of the Devils' work by clicking here. Those Sun Devil fans are chewing on way too much peyote again. Not since the Jake"the flake"Plummer, have ASU fans been in this state of dementia. if there were signs like this in Seattle for U-Dub, people would laugh. hard. One thing I've noticed in my travels is that as a general rule, only teams that want people to believe they're badasses, take out billboards telling people they're badasses. Established, quality programs don't put that kind of stuff up. At least not from what I've seen. The ultimate in hubris was four years ago when Oregon put up billboards... in Times Square and San Francisco. Oy. Still, there's no greater way to doom your team, especially one that already had only modest expectations. to be fair, Nike put up the billboards to promote Harrington for Heisman, not the Ducks for the national championship.